Puppet Theater Festival 2019 exact dates and events will be updated as they become available. Meanwhile, you can check out last year’s events. This year Jerusalem will host the 27th Puppet Theater Festival with local and international shows and outstanding events that will take place at cultural institutions around the city and outdoors. The festival will present modern puppet theater for children and adults, featuring 29 Israeli productions and 6 international productions from France, Poland and Germany. Using daily objects, the shows will stimulate your imagination and take your mind to new and surprising places. Expect seeing plastic bags turning into dancers at Afternoon of a Foehn; wax developing into tiny figures at Wax; and a cardboard box becoming a small farm with cows, rabbits, and all sorts of other animals at Grandpa Aaron and His Rain. The Picnic Club – 20 Artists will set up colorful picnic spots, including a picnic on icebergs in Antarctica, a tea party with a crazy hatter, and midget cabins on trees. In addition, an amazing puppet dance party will close the festival. A unique tour for children at the Bread & Cookies Museum will also take place as well as Starlight show that will take the kids to space and other great shows, cabaret performances, live music and cold beer for adults. The attractions and activities are all within walking distance from each other and in very affordable prices! Jerusalem Puppet Theater Festival 2018, August 12-16, 2018. Locations: Khan Theater, Train Theater, Beit Shmuel, The First Station, and Bell Park. Manager: Dani Pishof. Art Director: Shachar Marom. Produced by Train Theater and with Shachar Marom as the art-director and Dany Pishof as manager, Jerusalem Puppet Theater Festival 2018 will take place this year August 12-16. Following its annual tradition, the festival offers shows for children, teens, adults, and family-friendly shows as well. Alongside the theater shows, the festival will also host free afternoon activities for children, cabaret and live music shows for adults and 2 family-friendly outdoor events: The Picnic Club and a Puppet Party – at Liberty Bell Park. All shows and events will take place at several locations, within walking distance from one to the other, allowing a full day experience at the Khan Theater, Train Theater, Beit Shmuel, The First Station, and Liberty Bell Park. This year the festival takes part in Israel-France Season and hosts French theater companies for children and adults. The opening event will feature the show ASHES by PLEXUS POLAIRE company. The show combines actors, realistic puppets and projections, displaying a thriller that blurs the line between reality and fiction. This work has received many praises and runs in festivals all around the globe. This is an Israeli premiere. Children will enjoy a host of entertaining shows that will stimulate their imagination! One of those shows would definitely be Afternoon of a Foehn by Theater NON NOVA where a circle of fans turns colorful plastic bags into a group of hypnotizing space dancers. Another show that’s intended for young children is WAX by TJP Theater. In this show children will watch how the simplest raw material, such as wax, can be used to create a whole imaginary world by the actress that spills wax on the stage and welcomes the kids to join her to this fun discovery journey. The festival will also host two premieres by the local Train Theater: The Hungry Sandwich and The Singing City. The Hungry Sandwich is a comedy show created by Shay Persil and Jeremie Ravon that tells the story of a monster bewitched by love, a hungry sandwich and a man and a woman who lived happily ever after. The Singing City is a mutual creation of Hila Flashkes and Liat Shabtai that presents two actresses building an entire city using their own bodies. They becomes roads, skyscrapers, a secret park, and joyful parades. The actresses use objects, movement, sounds, noises, and of course, puppets. In addition, the festival will also feature interactive children shows. Using projections and puppets, Starlight will include a team of astronauts that will teach the kids how to fly a spacecraft, how to navigate in space and how to count sun-rabbits. The French-Israeli show Bread Museum features two comic tour guides that will take the kids to a special museum tour that displays ancient cookies and pre-historic leftover bread. Older kids (ages 10 and up) will enjoy Billy Fog shadow show by the Polish theater – Teater Figur Krakov. The show tells the story of Billy, a boy with special powers, who copes with the death of his cat through a unique encounter with ghosts. Another special production is Paris Bonjour, an amazing work by artist Jacques Templeraud that specializes in object theater. The show features works by Ornan Braier, Ronit Kano, and Gershon Waisefirer. Adults will enjoy selected shows from the contemporary and visual puppet theater Séance. The mysterious work by artist Jan Jedenak will expose the audience to a mad state of consciousness using visual elements. WART is a dance work by artist Rennana Raz that features images from the world of wars and expresses them through dance. Alongside the theater shows, cabaret performances and live music sessions with wine and beer will take place every evening at the Khan Theater. The Picnic Club – This interdisciplinary event for the whole family features 20 Artists, who will set up picnic spots that go beyond your imagination: a picnic on icebergs in Antarctica, tea party with the crazy hatter, royal picnic, midget cabins on trees, walking houses, Little Red Riding Hood, imaginary chess, and many more surprises. The event will open to the public on August 9! Puppet Dance Party with huge costumed characters and music – open to the general public. Additional free events: The Mole’s Spring show at the First Station and the Cactus Petting Zoo at Khan Theater. Looking for accommodation while you’re in town for the Puppet Theater Festival 2018? Check out our complete listings! Don’t go to the festival on an empty stomach! 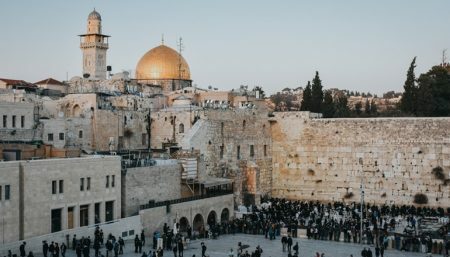 There are plenty of amazing restaurants in Jerusalem, whether your looking for a quick bite, something romantic or family-friendly! Once you’ve experienced the Festival, check out the rest of what the city has to offer! Show coupon no. 2222 and get a special discount.